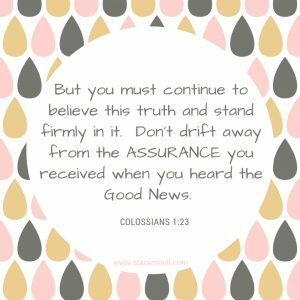 This entry was posted in Devotional and tagged acts 2:39 assurance biblical parenting God's promises for parents John 15:5-8 promises on June 15, 2017 by stacie.snell. Can I tell you something? Parenting is absolutely terrifying. Those of you that are knee deep in the muck of your own parenting challenges are probably nodding your heads in agreement right now. If so, thank you! Isn’t it a relief when we realize we are not alone? My children are ages four and six, and the challenges we are facing already at such young ages have me scared out of my mind most days. I mean, we still have to survive their adolescent years. And when I think of this crazy world we are raising them in, well… fear could just swallow me up in one swift gulp. I just need some assurance, really. Anybody else? For instance, I’d like to have some assurance that our strong willed child will at some point submit to authority. I’d like to know that my very sensitive child will learn to let God and what He says about her be the loudest voice in her life. I want the assurance that my girls are going to make wise choices and know God personally and intimately while still maintaining close relationships with my husband and I. I don’t know about you but I just want assurance that when this parenting gig is all said and done, my kids will have grown into amazing, God fearing warriors of God. 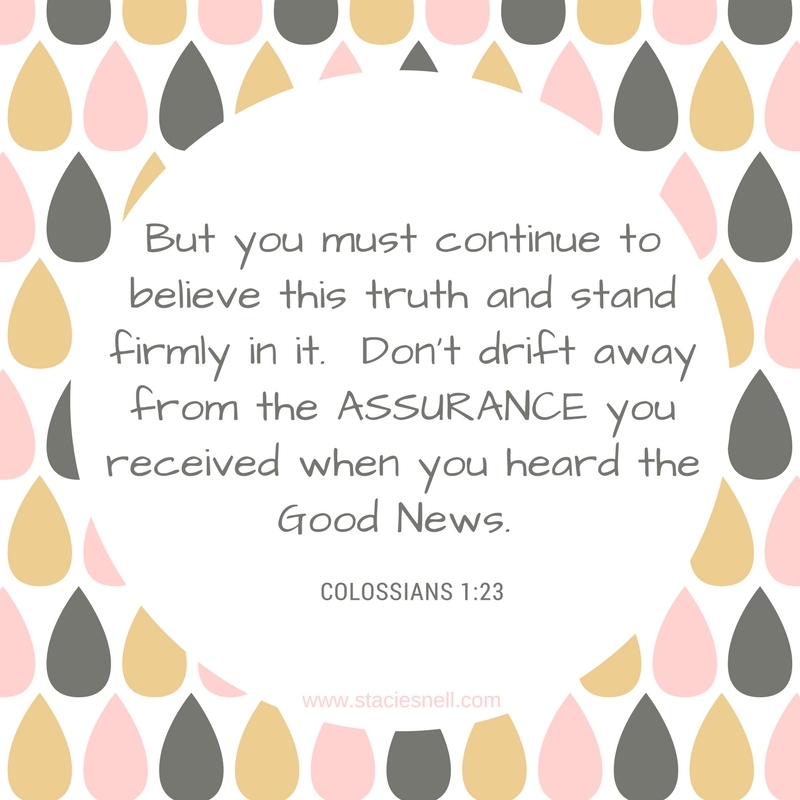 We can have assurance. The Word of the Almighty God promises to give us some assurance, and all of God’s promises are backed by the honor of His Name (Psalm 138:2). If we stay connected to Jesus, Our Vine, He promises an abundant harvest. If we remain at home in God and let His words be at home in our hearts, the promise is that whatever we ask will be listened to and acted upon. Praise you, Lord, that you hear and act upon every desperate prayer offered up by each mom swinging from the end of her rope. And the most beautiful assurance of all is that I don’t have to do this alone. In fact, that passage says I can’t do it alone. We are going to ride this thing out in connection with the Most High God. The Bible is full of the Promises of God that will give us the assurance we are looking for if we just believe that they have our names written on them, and they do! So yes, this parenting thing is scary and hard and down right exhausting, but we have the assurance we need to stand firm and ride it out. Lord, Help us to parent these babies well. Thank you for the assurance we needed to courageously keep trekking on. Help us to cling to your promises and to live and parent as though your promises are true because we know that they are. As we remain connected to you, may our harvest in parenting be fruitful and plentiful. May the lives of our children bear the fruit of our labor as we raise them to know you both personally and intimately. Thank you for bending low to hear our prayers and for moving on our behalf and the behalf of our children. We love you. Amen.